Merriam-Webster's dictionary defines "burgundy" as "a purplish red color." A number of shrubs, large and small, bear burgundy flowers. Some, like the hybrid rhododendron Sefton, are hybrids or cultivars of species within common genera. Others, like the Loropetalum chinense variety Rubra, are more unusual. If burgundy is part of your garden color scheme, it is possible, with careful planning, to have flowers of that color in bloom for much of the growing season. Loropetalum chinense is a relative of witch hazel and is native to Japan and southeast Asia. Like witch hazel, it blooms in the late winter or very early spring. The evergreen leaves are alternate and ovoid. The fragrant, spidery flowers, which appear in clusters, have four thin petals apiece. At least two Loropetalum chinense varieties, Rubra and Razzleberry, feature burgundy flowers.These varieties tend to bloom earlier than others in the species and the leaves may have a reddish tinge. Pittosporum tenuifolium is a small tree that is often clipped into shrub or hedge form. The leaves are 1 to 2 inches long with wavy edges and the small flowers are a dark burgundy. Another spring bloomer is Aesculus pavia, a species of horse chestnut tree. The pavia species can be grown as a shrub and will reach 12 feet in height. Some varieties feature showy burgundy flower panicles, which can be up to 10 inches long. In early summer, gardeners in warm winter climates (USDA zones 7 through 10) can enjoy the blossoms of Florida anise (Illicium floridanum), a native shrub or small tree with leathery, anise-scented leaves and small, narrow-petaled burgundy flowers. Hibiscus acetosella is a tropical member of the mallow family. While other hibiscus are grown purely for the hollyhock-like flowers, the acetosella species is often grown for its showy, colored three- or five-lobed leaves. The flowers can be maroon or lighter shades of red or yellow. 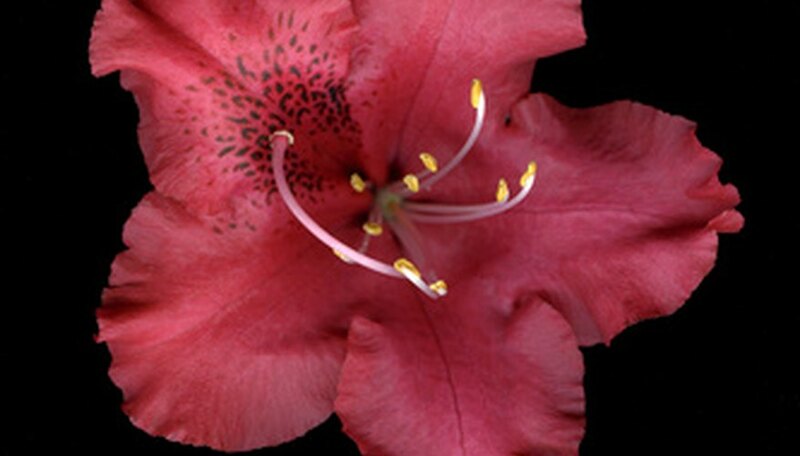 Sefton is a hybrid rhododendron variety with burgundy flowers. It is noted for both its cold hardiness and its tolerance of light or partial shade. The blooms appear in the spring. Another shrub that is somewhat tolerant of shade is Calycanthus floridus or Carolina allspice. Blooming in late spring to early summer, the shrub produces maroon flowers with a spicy, fruity aroma. The flowers are composed of numerous petal-like tepals that give them a spider-like appearance. Color in flowers is relative and dependent on a host of factors including climate, soil chemistry and light exposure. A plant catalog may list a variety as having "burgundy" flowers and, depending on growing conditions, the actual flower color might range from dark pink to nearly black, with or without purple overtones. To be sure of the color, try to buy a specimen when it is in bloom.